It was a spring clean sort of a Sunday at HBK this weekend. Fortunately the strong winds of Saturday had abated, and the forecast rain stayed away. 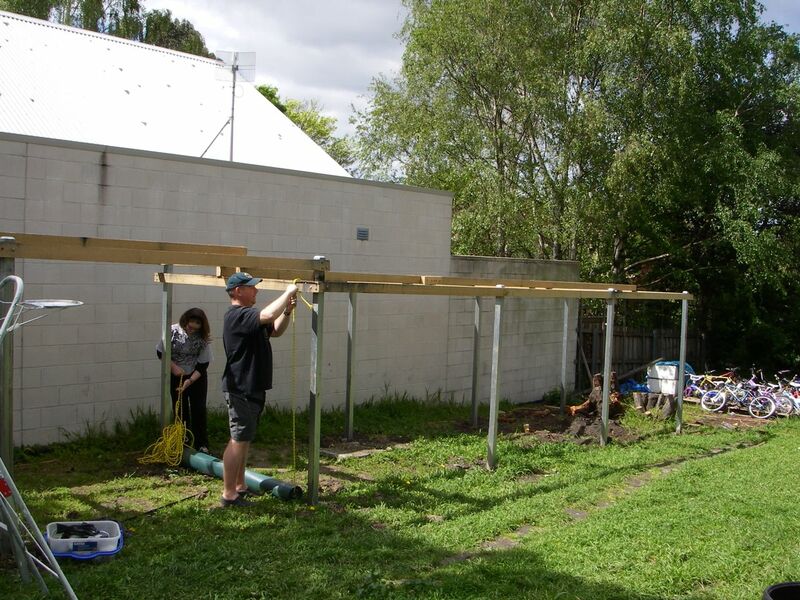 At long last we had the ‘bones’ for the keenly awaited bike hanging structure – 6 pairs of steel posts and about 50m of hardwood rails combine to make a 13 metre long shelter. We had a long roll of shadecloth, hundreds of gang nails, dozens of hooks, several drills, a ladder, and a vague plan. 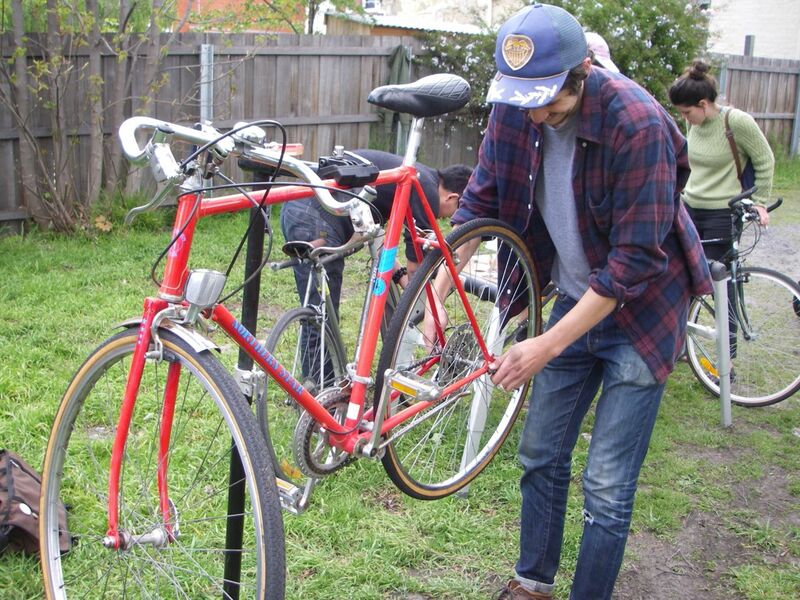 Our goal was to provide our oft-rained on bikes with some semblance of shelter, and the ability to have their running gear free from weedy entanglements. Ben, Matt and Maddie did a huge job cutting and fixing the shadecloth, ably helped out by Alex and Aaron. They were later joined by Lance and Bernd who assisted with the drilling, and screwing in of hooks (until we ran out!). Lance and Ben then made significant inroads on sorting of bikes. 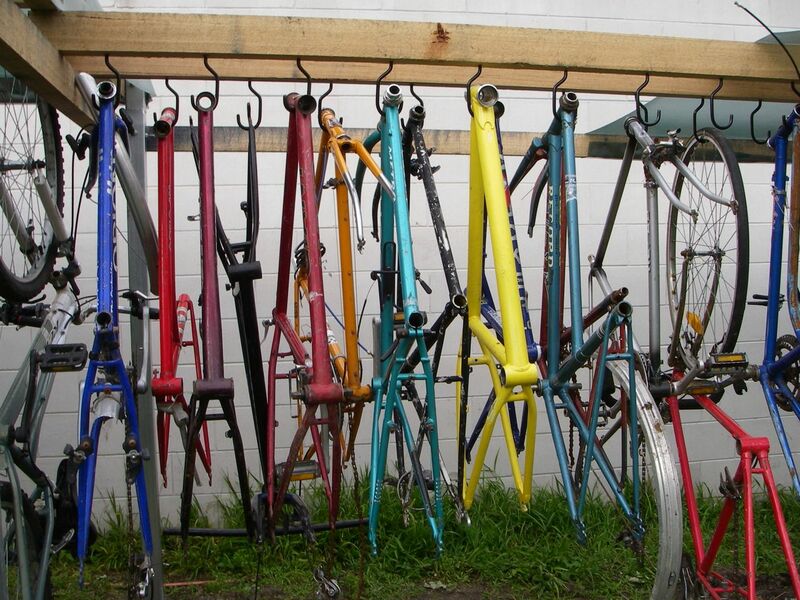 It seemed appropriate that the first bike hung was a girls Huffy “Show Off” (geez it was heavy). 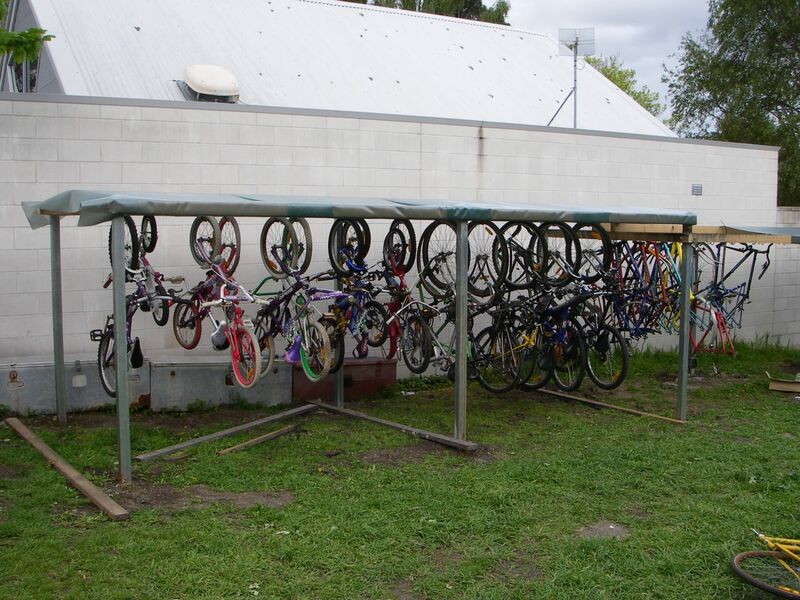 The planned configuration is to have kids bikes closest to the shed, and a dedicated bay at the far end for ‘project bikes’ – those that have tags on and have been worked on in past 3 weeks. We also have a heap of frames which we’ve hung quite closely in the middle section, in order to make best use of the space. 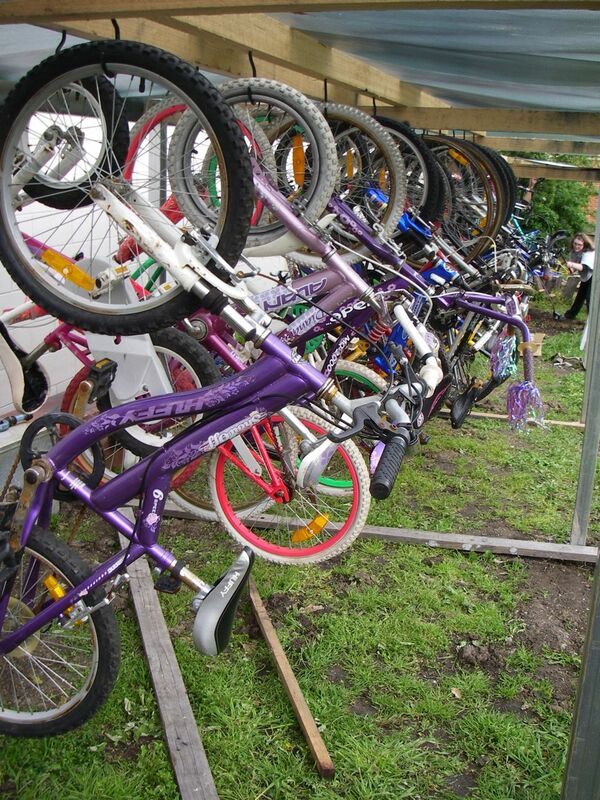 Over next few weekends a few ‘cull or keep’ decisions will be made with regard to a heap of kids bikes and MTBs. 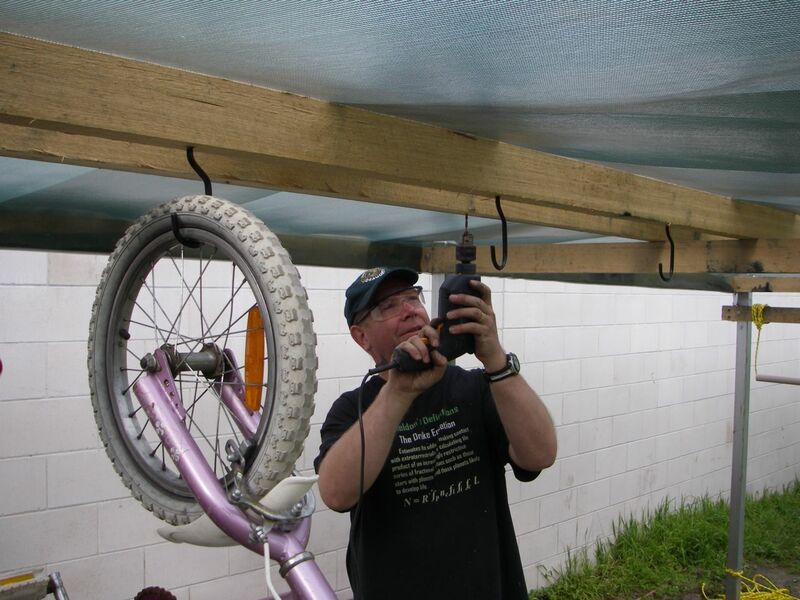 As you see in the photos 1 and 3 it was a great day of ‘VP’ (visual progress) and to think we also had about 14 people there at times working on a whole range of bikes – classic ladies step throughs, polo bikes in various states of repair and more. So if you are thinking of coming to HBK this coming weekend it would be ace if you could lend a hand to fix the last bit of shadecloth. The sooner we get this job out of the way the sooner we get to fix bikes.